One of my favorite things about summer is the fruit. There is always an abundant amount and a wonderful variety of fruit to choose from. What is your favorite summer fruit? I would have to say that I have several, but one of my favorites is the blueberry. It seems to be one of the most versatile fruit around. I love to eat the blueberries by themselves, but I also love them in a salad, and they are great to bake or cook with. One of the local grocery stores had a sale on blueberries a couple of weeks ago and so I had purchased a pint of them. 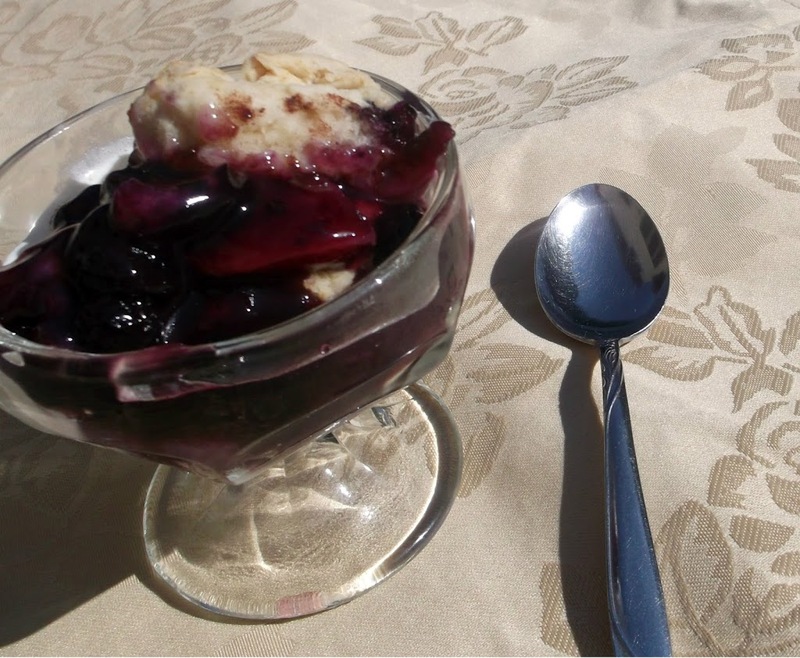 My kids were going to be home for Sunday dinner that week and so I decided to make a dessert with the blueberries that I had purchased. The recipe called for 3 cups of blueberries and I had only the one pint, but I did have some strawberries in the refrigeration also so I decided to use some strawberries to make the 3 cups. I have to say that this cobbler turned out be delicious. There was not one bite left of this dessert by the end of the meal. We all enjoyed it; I think there were a few of the kids just about licking out their bowls trying to get every bit of the cobbler. Needless to say I have made this one again. The second time I added a couple of more fruits, I had blueberries, raspberries, strawberries and some peach thrown in the cobbler. I have to say that this was just as scrumptious as the first cobbler. 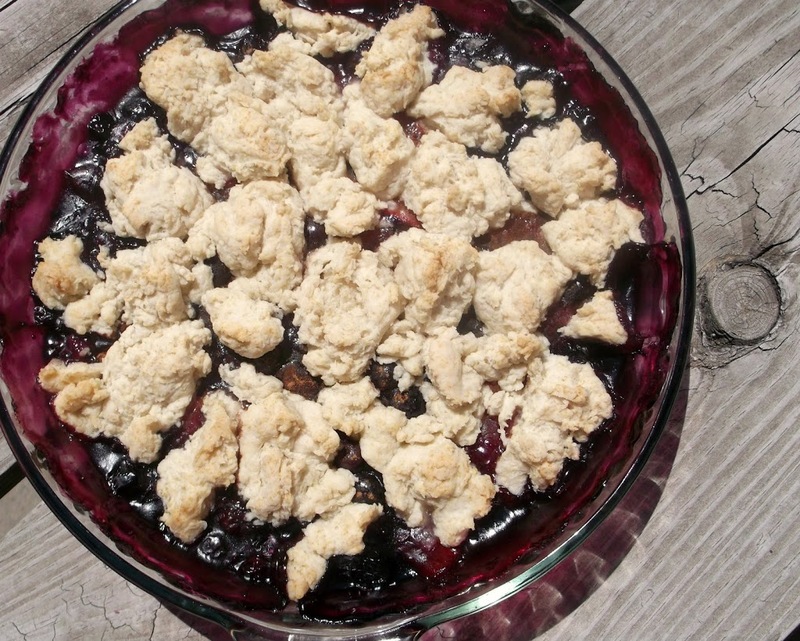 So when it comes down to this cobbler I think that just about any fruit would make this a tasty dessert. I hope that you will give it try and let me know what kind of fruit you used in your cobbler. In a saucepan, combine sugar and cornstarch, stir in water. Bring to a boil; stirring constantly, boil for 1 minute. Add fruit. Pour fruit mixture into a lightly buttered 1 1/2 quart baking dish or a 9 inch pie plate. Sprinkle with cinnamon and drizzled with 1 teaspoon melted butter. Stir together the flour, baking powder, and salt. Pour milk and 3 tablespoons melted butter into a measuring cup; add to flour mixture all at once. Stir just mixture is moistened and forms a ball. Drop spoonfuls onto the fruit mixture. Bake at 350 degrees F for 25 minutes. Can I come over for a taste testing? Pretty please 🙂 Looks fabulous! You can never go wrong with a fruit cobbler. Peaches and/or blue berries are the best, IMO, but anything seems to work. And a pretty easy dessert to throw together. Good stuff – thanks. Yum… you have me drooling! This looks delicious! I love summer berries!! 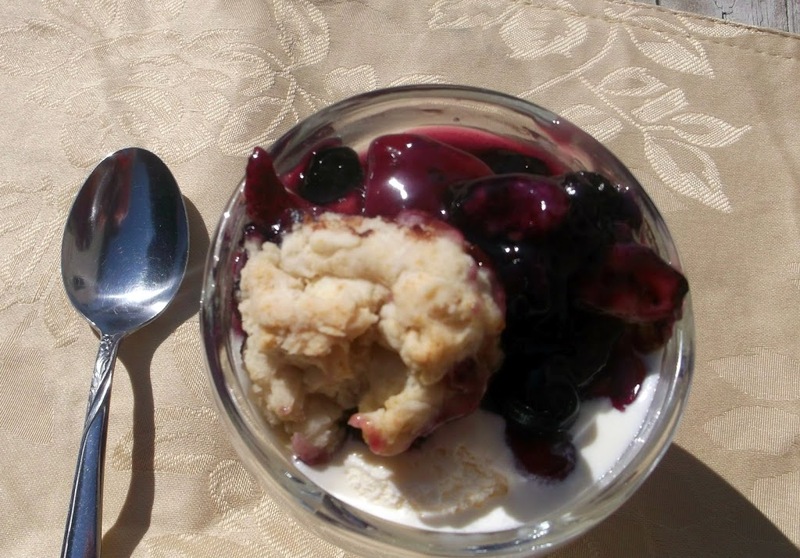 Your berry cobbler looks fabulous…I just want mine with a scoop of vanilla ice cream…yum!